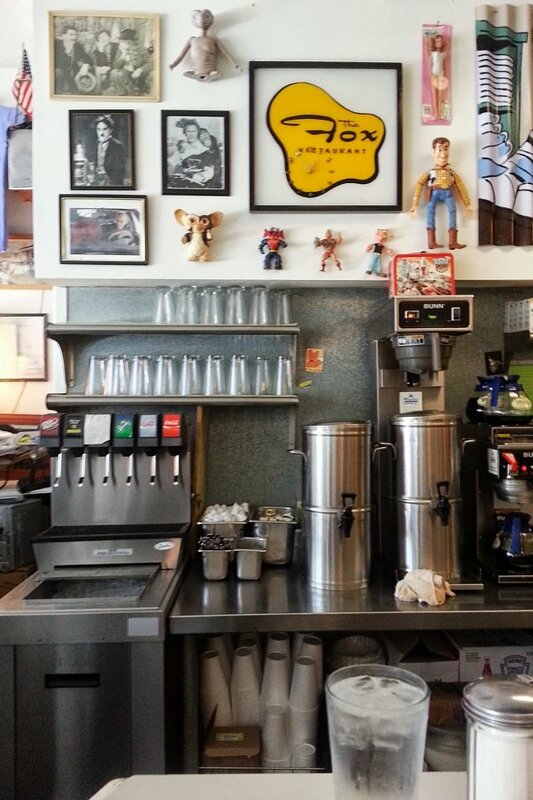 I'd always passed by The Fox, a diner about 7 minutes away in the Shoppes of Avondale area of my Riverside, Jacksonville Florida neighborhood, but never ventured within until this Sunday. My roomie and I wanted to see and eat something new and got a double dose of visual stimulation to go with it! When we first walked in at around 10:30AM the joint was packed to the brim without an empty seat in sight, but even waiting behind another hungry pair we were seated in minutes. Food arrives fast and people came and went quickly. Not that I minded waiting, above is the still life to the left of the door, love the signs and good luck "money tree". 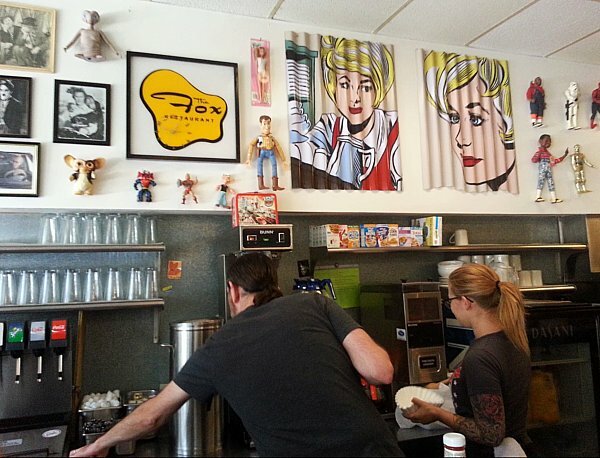 The decor was classic mod diner meets thrift-store-pop-culture-kitsch-explosion, it looks exactly what I want my imaginary-potential-future vegan cafe/vintage shop to look like. Get out of my head! Aaah! 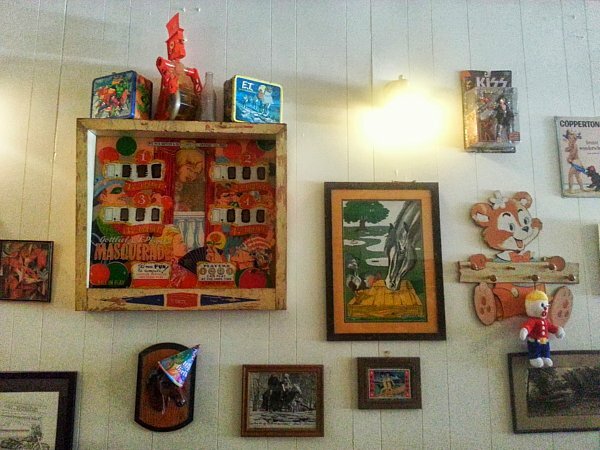 We took a seat at the bar and I intrusively snapped photos of the art and decor. Gizmo, He-Man, Family Matters, Mr. T, Spiderman, Toy Story, and Popeye action figures were on full display. A vintage tin lunch box showcasing my favorite transformer, Hot Rod teased me atop the coffee machine. I exploded and took pictures while we awaited our grub, to the amusement of some of the patrons as documented above. 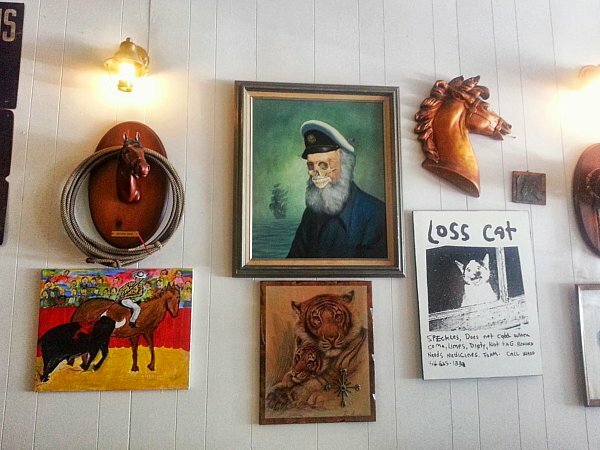 The art on the walls is a combination of thrifted vintage and antique finds, local art (the Loss Cat in the foreground by a local fav, Robert Land), and folk art. 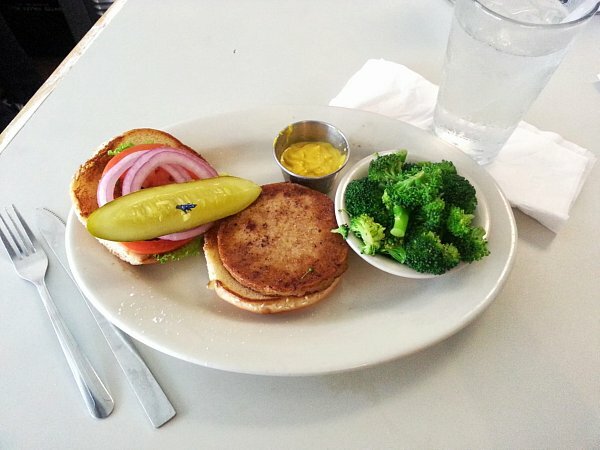 The only substantial vegan meal on the menu I could find (other the fruit or veggies sides or the salads, which wouldn't have been worth it without the meat) was the veggie burger. It was tasty but I gotta confess I was still starving afterwards. See that plate there? I need the whole thing filled with broccoli with the veggie burger as the "side", that's how you fill up this hungry vegan caterpillar. For...1 hour. So much to desire on this wall, give me the Everything! Love the fun details like the party hat on the dog plaque. This folky ghost ship and the framing appealed to me and inspired, love the creepy googly eye on the vintage artwork, too. The bathroom, with the black and white checkered floor, blue theme, round mirror and floral wall paper print was appealing too. Want the cozy mod chair in the bathroom! Come to me, sweet nectar. 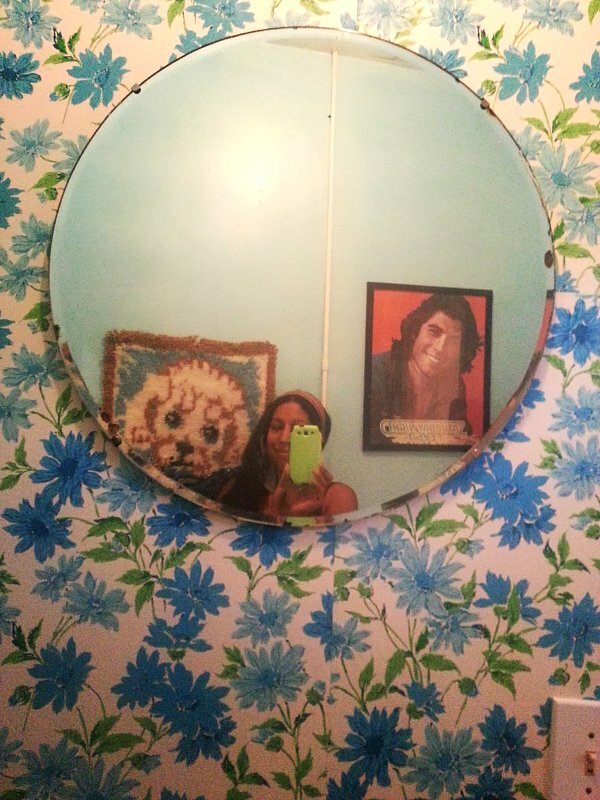 And the round mirror too, I need to find me some of these! I chatted with owners Mary and Ian chase before we left. The Fox has been in Shoppes of Avondale since the 1950s, thrifty years after the Shoppes' construction in the 1920s. 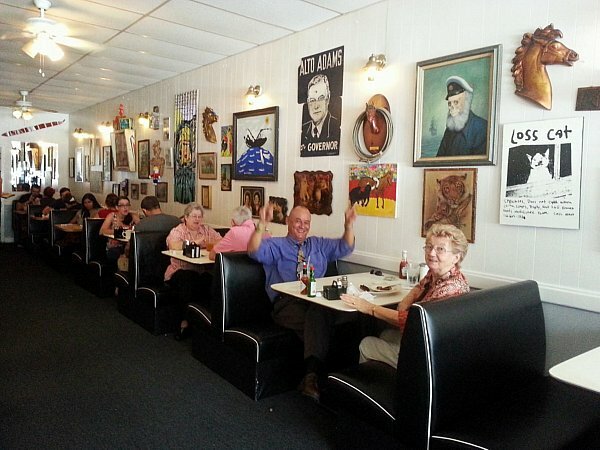 They're the fifth owners of the resturnt and Ian also owns popular eatery Chomp Chomp in downtown, Jacksonville. They pride themselves of providing the freshest food possible. With an obvious vintage theme going on Mary and I chatted vintage and reselling. She used to have a booth at Southern Crossing Antique Mall where I sell and is opening her own vintage shop this September 1st. Come to think of it, pretty sure I saw her at a yard sale not too far from The Fox a few months back! 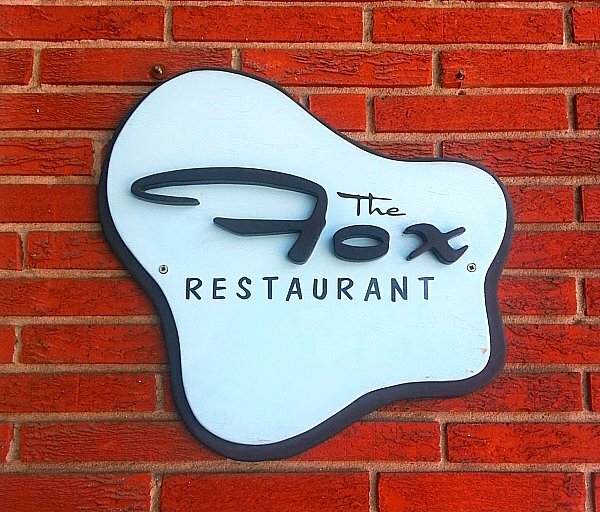 I certainly recommend The Fox if you want to experience great food (my omnivore roomie couldn't finish her Frisco Melt and side of Pesto Pasta) and a funky, friendly atmosphere. 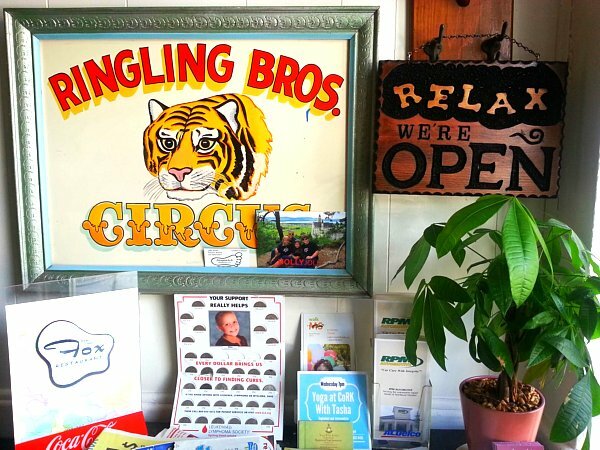 Its your friendly neighborhood stop with an eclectic crowd and decor. Just had to share it here because come on- it needs to GET OUT OF MY HEAD! But seriously, just a documentation of Collector's Style on full display. I left inspired and hope it inspires you, too. How cool! Love the couple in that first booth!!!! Looks like fun! I love campy joints like that. We go to a place called The Frog Pond when we visit Treasure Island, FL. It's decorated floor to ceiling with frog stuff, which for many years I also collected. Food is pretty good too. Whaaat, I've never heard of Treasure Island, Florida or The Frog Pond. Both sound amazing! My husband and I love The Fox. Great food, decor and people for sure. 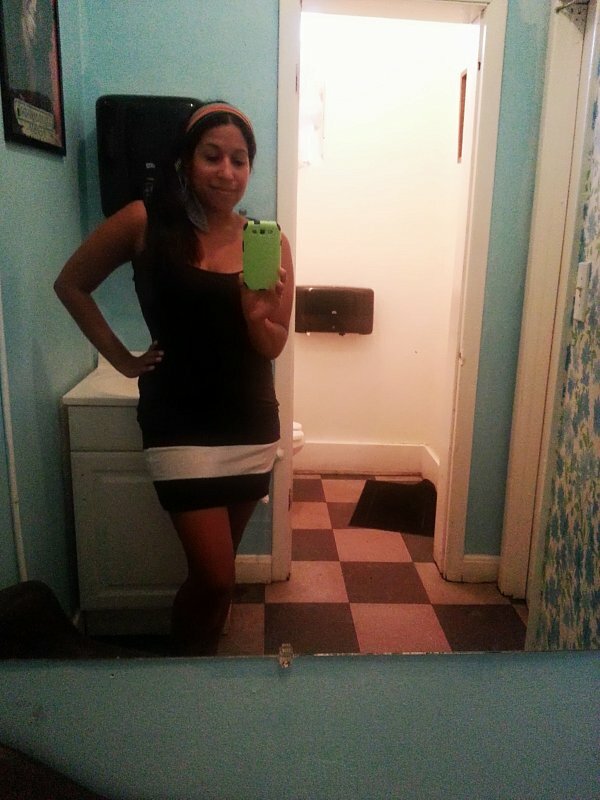 :D Definitely makes me want to explore more diners in town. Wow I would have been buzzing with excitement and inspiration visiting a place like this. I certainly was, they kindly let me take as many pictures as I wanted. I mourned the last-second decision to leave my digital SLR camera behind, something I rarely do. That is, leaving it behind is something I rarely do. :) Gotta have it by my side. I LOVE The Fox! I want a diner like that in my neighborhood. I've got a good lunch diner downtown, but I miss brunch at The Fox! I've always wanted to eat here! 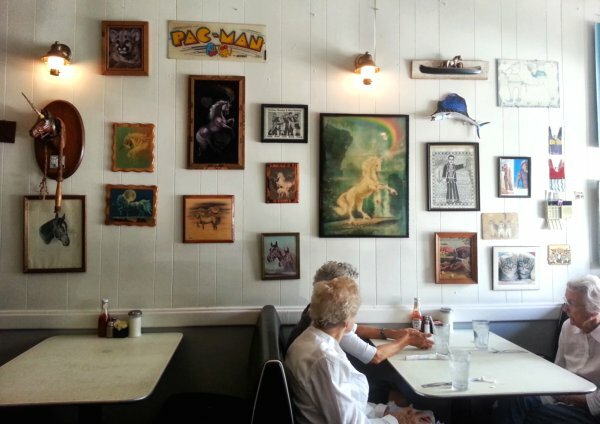 Nice shots; love the vintage and old diner look of the place. Kickbacks is a fave of mine and I've been meaning to go to Grassroots, too. There's still so many places in Avondale/Riverside area I want to experience especially since I live close to them again! Dooo eeet! I'm lucky to have so many tempting bites in walking distance, though I don't partake too much to keep mostly raw. Grassroots has excellent pre-prepared options and I love going through for produce and kitchen essentials, too. Ooo, that is such a cool place! Thanks for sharing. 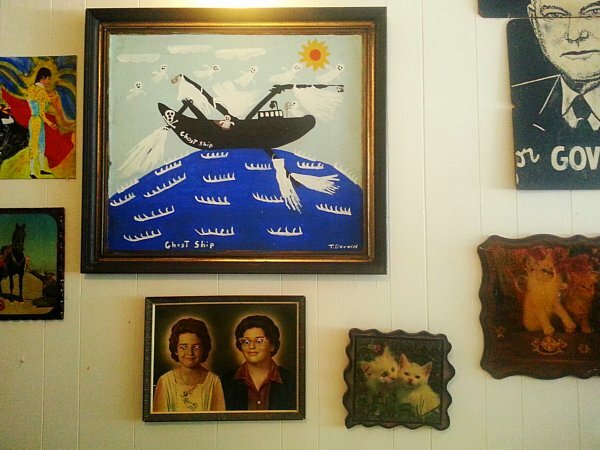 I particularly love the ghost ship print and the googly eye artwork - hilarious and kitschy. 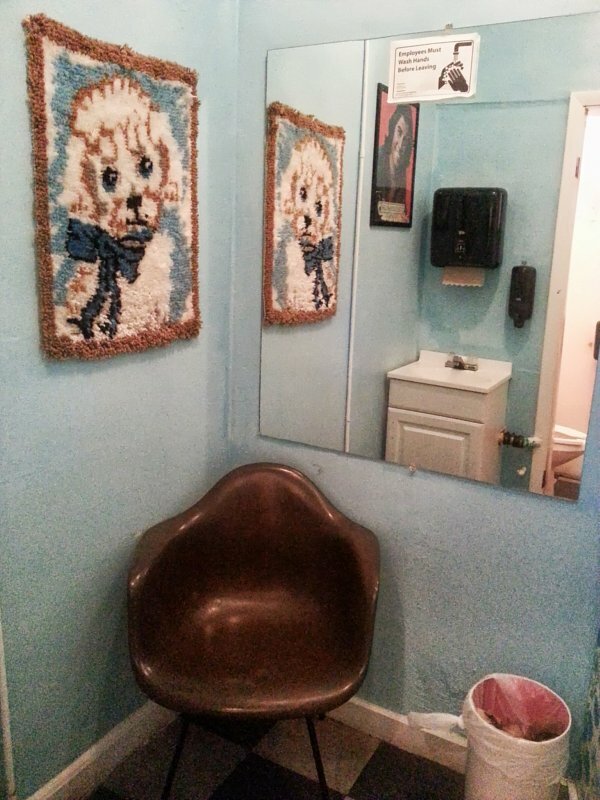 Plus, the doggie latch hook rug wall art in the bathroom was really cute and sweet without being overly so. I love the ghost ship too, one of my favorite bits in there.